from some of the best brands out there including American Audio, Gemini, Numark and many other major brands! We have turntables for those who spin old school or cutting edge digital media controllers that are completely self contained! Mixers, CD players, monitor headphones, cases & bags along with speaker & subwoofers to rock any venue! What's a trip to your favorite club without a good DJ? Everyone knows that music makes the party! While it's great fun to listen to a DJ mix it up on the dance floor, it's even more satisfying to be the one doing the mixing. 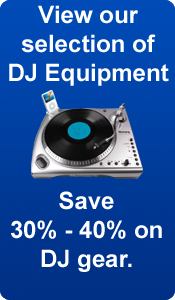 Whether you are a beginning DJ or a pro, the right DJ equipment is just as important as the music you choose. The world of the disc jockey and DJ equipment began with phonograph albums. Still today, this is the preferred medium of many DJ's of all skill levels. Any type of medium can be used, however. Cassette tapes, CD's, and even digital mp3's are other great options. Having a good piece of playback equipment is key. Lower end music players will get the sound across, but higher-end options allow the DJ to customize his or her sound and provides the option to give just about any type of experience to the crowd. Another piece of DJ equipment none should be without is a DJ mixer, which allows for continuous playback of the chosen medium. Nothing can kill the dance mood faster than periods of silence, which is why one song should "fade" into another. 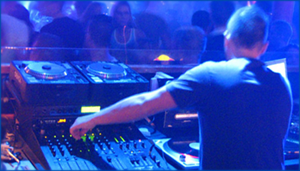 A mixer can also allow a DJ to produce original sounds or play a set of sounds over the chosen song. Anyone can be in charge of selecting the music, but a good DJ with a good mixer makes the music original and keeps it going! DJ Speakers are vital to keep the beats rocking the crowd. Speakers and subwoofers for DJs are made to stand up to the punishment of the constant bass beats that club goers live. DJ Speakers come in many shapes and sizes but by far the most common setup up are active loudspeakers pole mounted with a subwoofer rocking below. Also look for speakers that can be easily moved in and out of your event. 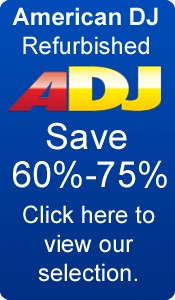 Drum machines and synthesizers are also great pieces of equipment for any DJ. This allows for even further customization of the music, and helps a DJ to discover his or her unique "sound". Drum machines are electronic percussion devices that allow the DJ to customize the beat to any piece of music, and synthesizers simply mimic instrumental sounds and sound effects. If more depth in the music is desired, consider purchasing a sampler. Samplers are a good way to loop one piece of music with another, so that a catchy riff or beat from one song can be mixed with another to produce a totally unique sound. This is what separates a DJ from the CD player remote control! While the equipment mentioned above is important for creating a one-of-a-kind DJing style, the smaller pieces of equipment are just as important. A good set of headphones is necessary to be able to ensure the correct mixing and equalization of the tracks. A DJ microphone is also important for communicating with the crowd and revving up the energy. For DJs who prefer using good-old vinyl, consider dj turntables. While this piece of equipment may sound complicated, it is simply an attachment for a record player that allows a DJ to play more than one groove of a vinyl record at once. With the correct pieces of equipment, any music lover can learn to mix up the sounds of the music and provide a dance crowd with something totally unique. Keeping the dancing going is the mission before a DJ, and the right equipment is the weapon! It's up to you to start killing 'em with your beats!